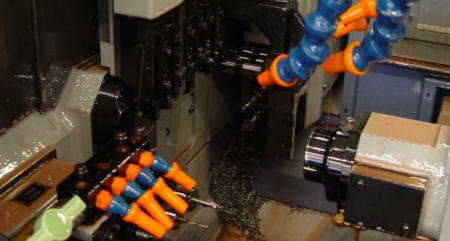 With high spindle speeds, rapid turret action and bar feeding, parts are made quickly and accurately. types of special hardware can be efficiently and accurately made from a variety of materials. Nakamura machining center with 2" barfeed capacity. Twin spindle twin turret with 10 live-axis capability.